On a beautiful fall day, I notice a group of children discover a dead squirrel lying in a parking space on the side of the road. I've seen these children playing together on the corner playground after school each day, their age’s range from kindergarten to third grade. At first they stand around the squirrel talking about it, staring intently. By the looks on almost all of their faces, it seems this is the first time that any of them had seen something dead, in real life. I am mesmerized by the children and stand back from the group wanting to see for myself how this is going to play out. It seems somewhat like observing a social experiment. The children stand on the curb by the side of the road, knowing if they step foot off the curb their parent will call out from across the playground (where we all gather to talk), “Get out of the street." I can tell that huddled together around this dead animal, they are coming up with a plan. They are determined to get it out of the street and buried. The smallest boy of the group continuously informs the other children, “We need to get it out of the street.” He begins to bark orders to the other children, assigning a few children to find sticks and begin digging the hole to bury the squirrel. And then telling the rest of the group, “We need to pick it up and carry it to the hole”. Many a “Ewww!!! I’m not touching it!” can be heard from the remaining children. Burying the squirrel seemed like a good idea until there was mention of actually touching it! The bickering on who was going to do it goes on for several minutes. One parent goes over to explain how it could have diseases and it’s never a good idea to touch any animal that you find dead. “Just leave it alone," she says to them and turns and walks back to the rest of us, who are standing on the sidelines talking. The moment the mom turns her back, the children are back to arguing over new technique ideas that they just thought of, each child passionate and convinced their idea is the one that will solve the problem. Maybe you’ve seen this scene before, around a conference table at work, amongst your siblings or family members? The ages may be slightly older, but these children are clearly imitating the adults in their lives, negotiating and strategising to come up with the best possible solution. As the children are arguing, one of the smallest girls leaves the group with determination on her face and a furrowed brow. She is searching the ground for something. The other children call over to her to come back to the group, but she is persistent in her search and eventually finds what she is looking for. The stick is only inches shorter than her and it takes both hands for her to hold it. She ventures off the curb and begins to slide the squirrel over to the curb. It’s a slow process. 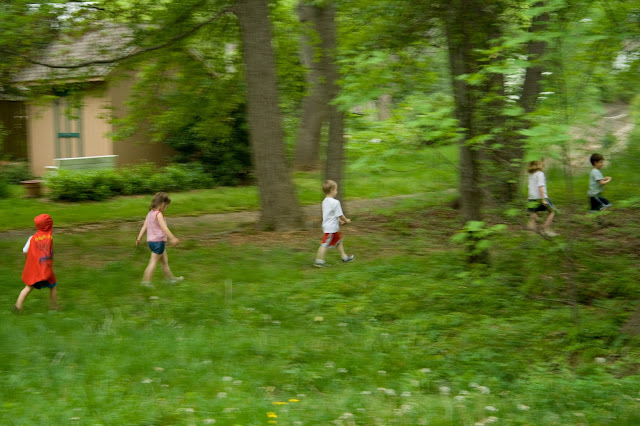 With each gentle maneuver, the other children scream and jump because suddenly the squirrel looks as if it’s come back to life.